Having a good CRM in place for your startup is extremely crucial, especially when you begin your outbound process and start to hire out the sales team. Most people think of SalesForce when they think of CRM, but there’s actually a lot of alternatives out there that can work well with you from the beginning and will cost much less. I’ve personally tried most of the well known CRMs out there and can honestly say that there are pros and cons for everyone of them. I’ll try to make the best recommendation based on your needs below. Quick note: NONE of the following CRMs that I mention are affiliate links of any sort. I am not affiliated with any of the companies. All reviews are from my own experience. One of my most favorite CRM out there. 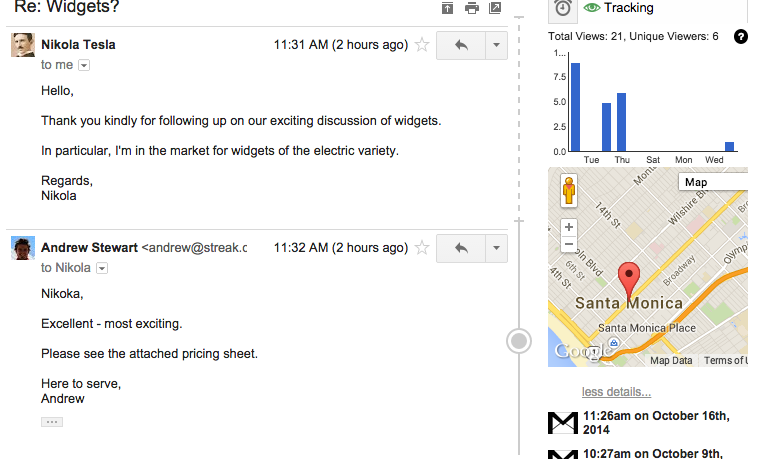 Streak integrates directly into your Gmail’s inbox, so that you don’t have to keep switching back and forth between different external tools. Collaborate with a single click. Share contacts, email, files, and anything else needed to get the job done. 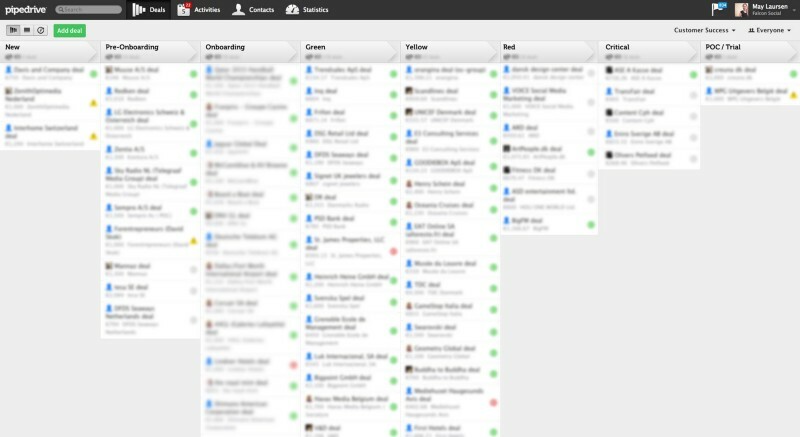 With Streak, you could also set pipelines and share them with your teammates. In addition to that, Streak also comes with mail merge for bulk mailing, email trackers to see if your invoices are being opened :), as well as an easy note taking sidebar all within your gmail. A lot of people didn’t know that Hubspot actually has a free CRM. Their full suite product may be a little bit too pricey for the average startup, but their CRM is free and works really well. The thing I like the most about Hubspot’s CRM is that it is a full suite CRM that comes with all the features that you need to get things rolling for your sales team. The Hubspot CRM allows you to control your content, channels and marketing performance while getting a 360 degree view of the people who matter most to your company from your dashboard. It also comes with the the funnels mappings, pipelines, task, company information and many more. You can add custom fields, filter records, select and organize columns, and save different views easily. The most powerful thing is that HubSpot CRM is closely integrated with the HubSpot Marketing Platform. Effortlessly capture, score, and hand off leads to your sales team. Now there’s a big downside to Hubspot that I dont like. First of all, customising everything is very difficult because Hubspot does not allow you to do a lot of customizations. You can’t change the lifecycle tags and a lot of other things, so it can get clunky. Just getting started and looking for a robust CRM with phone systems integrated? Then Close.io is the best way to go. 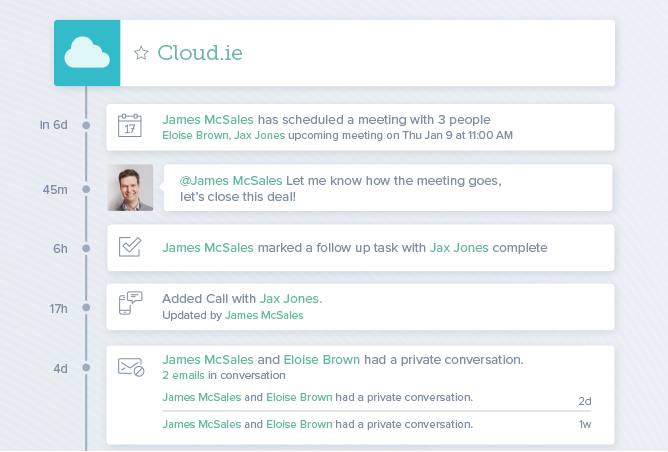 With Close.io, you can make and receive calls with just 1-click. All calls are logged automatically (no manual data entry!). Lead activity information pops up as soon as the phone rings so the data you need is always at your finger tips. I personally think it’s a quick and simple alternative to SalesForce, so perfect for startups. It’s not free but comes with all the stuff that is necessary to get things rolling, like email tracking, bulk mailing etc. RelateIQ is a SalesForce company, but it is one of my most favorite CRMs. I would say that this CRM isn’t made for big teams, but it remains as a CRM that I use personally to manage my own contacts. RelateIQ automatically updates itself with relevant information from your prospect and customer communications, making it extremely hands off for you. With RelateIQ, you can sync together any conversation all under one platform. Know everything about your customer interactions with one click, from their last touchpoint to your next opportunity to follow-up. RelateIQ integrates extremely well with your inbox. The only downside is that it is kind of hard to get things started with RelateIQ. The onboarding may be a little bit confusing in the beginning, but will rock your world once you get a hang of it. This is what we used in the very beginning before switching around and testing different CRMs. 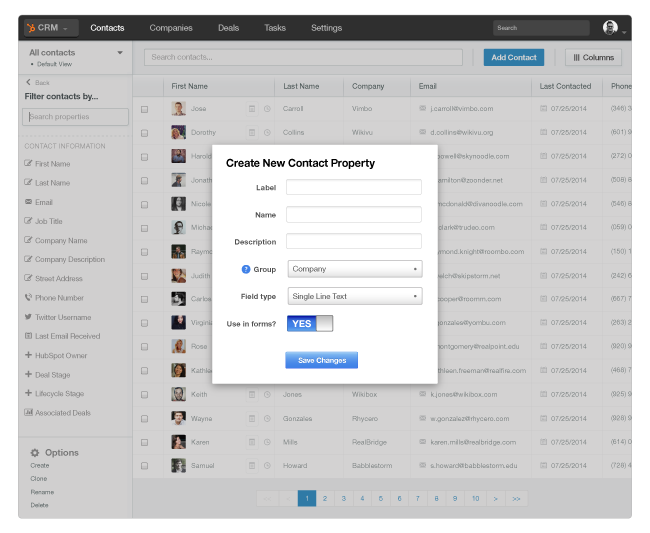 This is still a very good and stable CRM with almost all the functions that a CRM needs. The main reason for us leaving HighRise is because a CRM like Hubspot is just a lot more powerful solution for us as we grow. There are a few things that Highrise excel in. Highrise is the perfect place to track contacts and communication so that your team can view the status of any deal or relationship. Make notes on a meeting, share important emails during negotiation, or share tasks related to any contact or project. You can also mark information private to yourself or select team members, so that you share what you want, when you want. You can track and share your contacts and emails in Highrise. It’s easy to import your contacts from Outlook, Gmail, Excel, and more. Reply to important emails at the right time with the right information. Another thing that I loved about HighRise was it’s integration. You can integrate it with anything from Mailchimp to Toutapp for emailing. I’ve never really explored Pipedrive because the first time I tried it was after I discovered Hubspot. 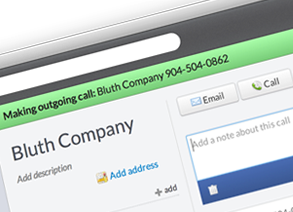 Pipedrive is well known for being a simple, clean, and straight forward CRM that helps you manage your sales pipeline. When I tried it, I thought it was a bit too simple, but not as simple as Streak. The system is so simple that it can be very easy to add duplicate information into the system. It is then extremely simple to merge but it can be an annoyance. 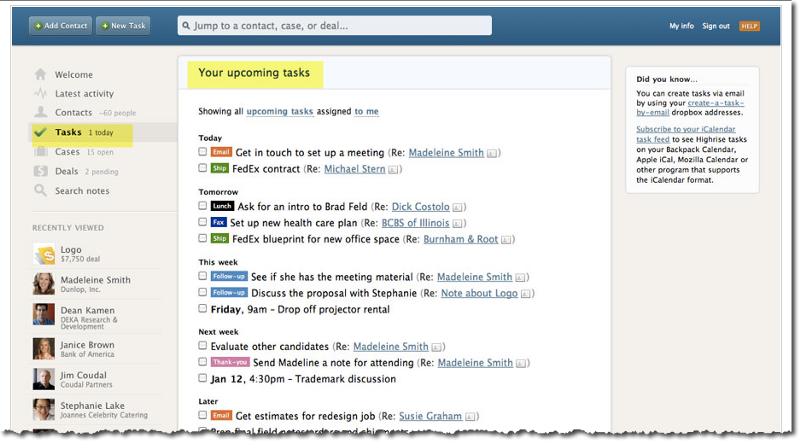 In a way, Pipedrive felt like a sales version of the task management app Trello. What if you don’t have any cash or don’t have enough customers to start using a CRM? You can always start with something dead simple like an excel sheet. We did this with our first 5 customers!! haha. What happens if you have more than 10–15 customers, but still don’t want to use a CRM yet? 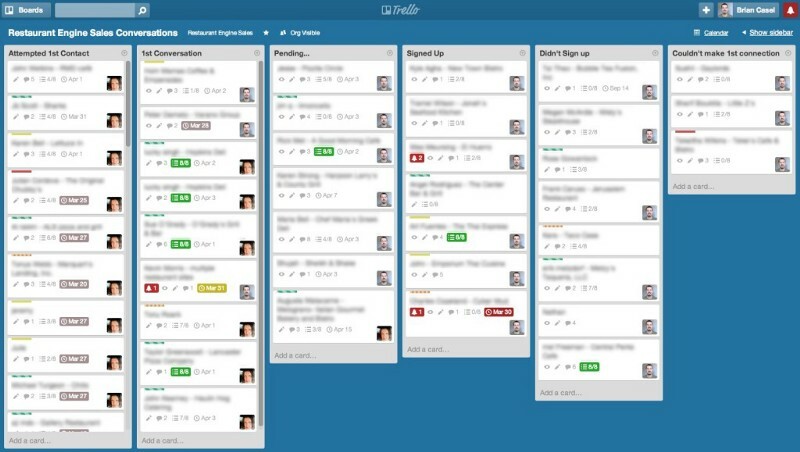 You can use Trello! Assign task to each project and get creative with the funnels. I started off with just a spreadsheet and a note pad to track my leads. Yeah, never again, but it was budget-friendly and I didn’t have to pay a cent, plus it got the job done so why not? P.S. We have a free 10 day sales hack course here. Posted in Sales•Tagged B2b Sales, CRM, Entrepreneur, Sales, Salesforce Productivity•Leave a Comment on What is the best CRM for startups?